In Turkey where the fresh artichoke hearts are so beautifully cleaned and so readily available on street corners, in the local markets as well as the big supermarkets, we usually think of stuffing them with the classic Turkish filling of diced carrot, potato and perhaps a scattering of peas. Or, early springtime, with broadbeans or bakla. To think of stuffing them with a mincemeat/ground beef filling takes a bit of a leap of faith and because it’s Ottolenghi, I am prepared to take it. I really like using the usual ingredients in different ways. Let’s be creative I say! 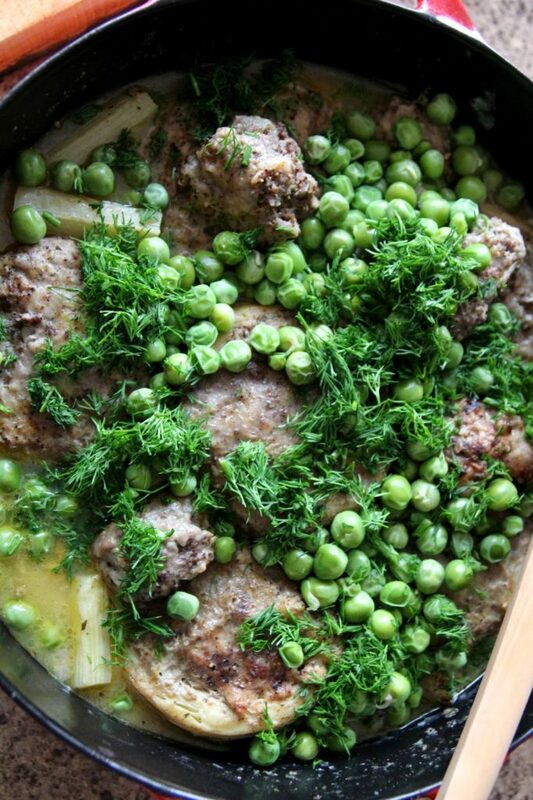 It’s also the time for fresh peas/bezelye, which I am buying from my local outdoor market and then shelling at home and popping in the freezer. Fresh dill or dereotu goes so well with artichokes as we well know: it’s a classic win-win combination around here! In the picture above you can spy a few lengths of something: these are the stalks of the fresh artichokes that my corner guy, Metin, will only give to favoured customers! Cook them the same way and they are equally tasty. Anyway, take it from me that when I saw this dish in Ottolenghi’s latest book Jerusalem, it appealed tremendously. You will know that in general I love his recipes and even have a tab at the top of my blog devoted just to him! I would also like to say that since the food photography course that I have just done, I now know and feel exonerated from the fact that the mincemeat stuffing doesn’t look as amazing as it actually did!! Apparently I should have only half-cooked it and assembled this entire dish step by step! If using leeks, blanch them in boiling water for 5 minutes. Drain, refresh and squeeze out the water. Roughly chop the leeks and place in a mixing bowl along with the meat, egg, spices, mint, 1 tsp salt and plenty of pepper. Stir well. Heat up 2 tbsp of the olive oil in a saucepan wide enough to hold the artichokes lying flat. 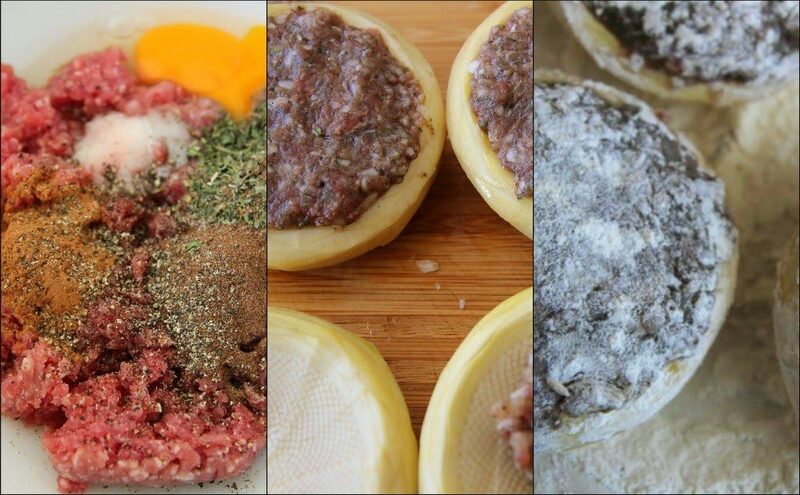 Fill each artichoke heart with 1-2 tbsp of the beef mixture, pressing the filling in. Gently roll them in some flour, shaking off the excess, so they are lightly coated. Fry in the hot oil for 1½ minutes on each side over a medium heat. Wipe the pan clean and return the artichokes to the pan, sitting them flat and snugly side by side. Mix the stock, lemon juice and remaining oil and season generously with salt and pepper. Ladle spoonfuls of the liquid over the artichokes until they are almost, but not completely, submerged; you may not need to use all the liquid. Place a piece of baking parchment over the artichokes, cover the pan with a lid and simmer on a low heat for 1 hour. When they’re ready, about 4 tbsp of the liquid should remain. If you need to, remove the lid and paper and reduce the sauce. Set the pan aside until the artichokes are just warm or at room temperature. 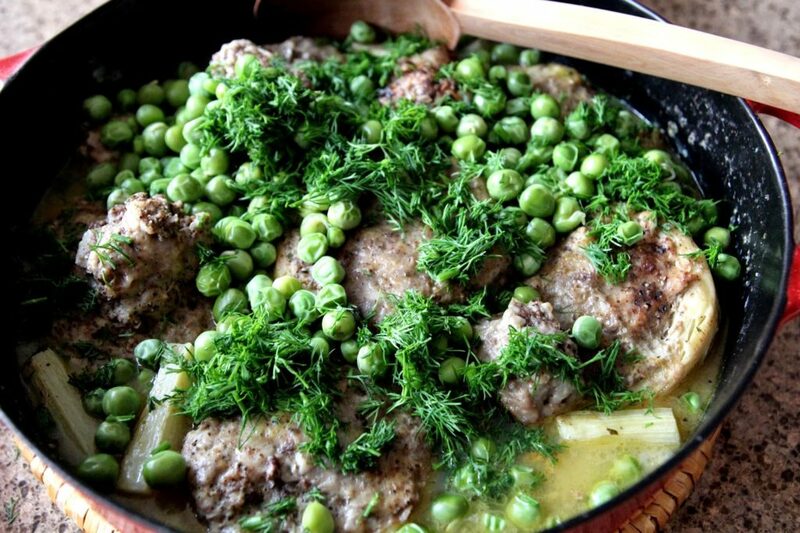 When ready to serve, blanch the peas for 2 minutes. Drain and add them and the dill to the pan with the artichokes, season to taste and mix everything together gently. Could you omit the meat and substitute it with something else. To make it vegetarian? Hello Judith, I feel that this is a very specific recipe that Ottolenghi created and the special spices blend beautifully with the minced beef. 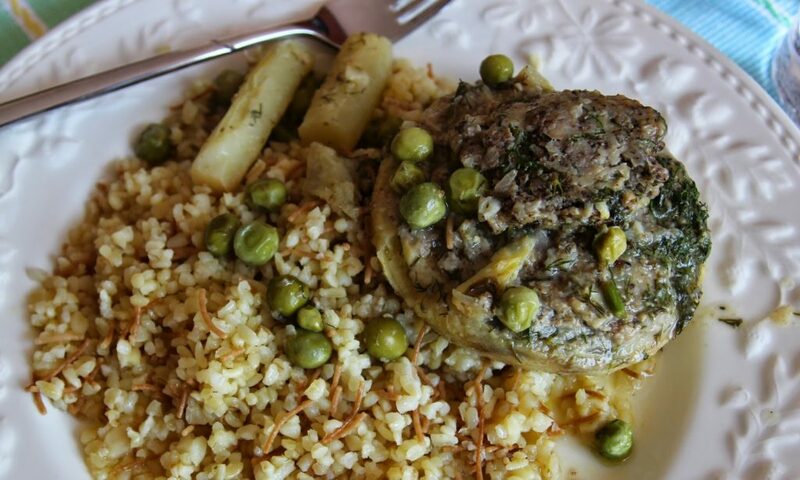 I cannot really see this dish being converted into a vegetarian dish and feel that should you wish to cook a vegetarian artichoke dish, then the dish linked here is hard to beat. http://seasonalcookinturkey.com/first-artichokes-of-season/ (you can cook this dish either with pearl onions or peas along with the other vegetables). This artichoke recipe is well known Turkey-wide and for good reason, it is delicious.